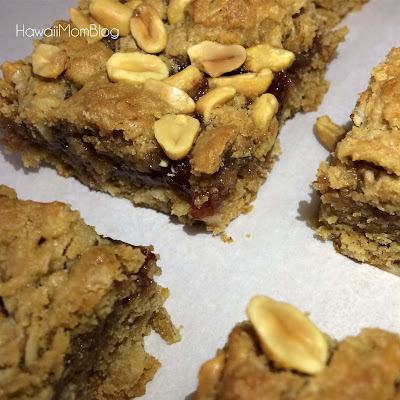 In my effort to clean out the pantry, I decided to make the Peanut Butter & Jelly Bars. It's similar to the recipe Nat posted, but this recipe incorporates rolled oats. The bars are thick and rich - I ended up cutting them in half! Such a yummy way to use up items in the pantry! In a medium bowl, mix together the flour, oats, and baking soda. In a separate medium bowl, cream together the butter and sugar, Stir in the egg, peanut butter, and vanilla. Pour the flour and oat mixture into the peanut butter mixture and combine. Press ¾ of the cookie dough into the bottom of a 9x13 prepared baking dish. Spread the jelly evenly on the cookie dough. Sprinkle remaining cookie dough on top of jelly. Sprinkle the peanuts over the top and press down gently. Original recipe found here on BudgetBytes.